Recently, our judges evaluated the multitude of monsters they received for this contest. 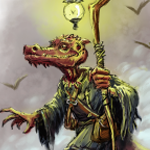 Now you too may see an unedited sampling of the creative entries we received as a part of the fifth monster contest that Kobold Press has run. Without further ado, we have the fext from Dave Olson. Come look at the second of our sixfinalists. Ancient and powerful beings across the multiverse grant magical knowledge to mortals through wildly dangerous pacts. Those bound to these pacts become warlocks, but the will and force of their patron is borne by more than just those who strike bargains for sorcerous power. A fext is a former warlock who has become wholly dedicated to their patron – mind, body, and soul – and functions as enforcer, bodyguard, and assassin. They are powerful undead slaves to the will of their otherworldly patron. Physically Linked. Each fext is a unique servant of their patron and exhibit the physical traits of their masters. A fext bound to the Prince of Winter archfey might have ice blue skin and a cold stare, while one serving the Great Old One Ghaundadar could have eyes of inky blackness and an oily sheen over their entire body. The eyes of every fext are tied directly to their patron’s mind, who can actively see through the fext at any time. The fext also possesses a telepathic link to their patron. Transformation. The process a warlock undergoes to become a fext is horrendous. The warlock is emptied of whatever morality and humanity they possessed as wine from a jug, and in its place the otherworldly patron pours their corruption and unearthly will. Whatever life the fext led before turning into their undead form is completely gone. Dark rumors whisper of some patrons keeping the original souls of their fext servants hidden away, but the process is so complete that a fext carries no memories of their former existence. They exist only to serve. Ambitious. Scholars have debated about how many fext an otherworldly patron can command. The more powerful and well-established patrons (such as Oberon or Great Cthulhu) are known to have at least a hundred, while others have only a handful (or none). Where there is more than one fext, however, there are ambitious maneuverings amongst them to curry the greatest favor of their powerful lord. Each fext is bound to obey the commands of their patron, but they always attempt to accomplish it to the detriment of their fellow fext. Scheming is common and rampant among them and they try to work without the aid of other fext as much as possible. Innate Spellcasting. The fext’s spellcasting ability is Charisma (spell save DC 16). It can innately cast the following spells, requiring no material components. Magic Resistance. The fext has advantage on saving throws against spells and other magical effects. Magic Weapons. The fext’s weapon attacks are magical. Patron Blessing. A fext is infused with a portion of their patron’s power. They have an Armor Class equal to 10 + their Charisma modifier + their Dexterity modifier. Multiattack. The fext makes two melee or ranged attacks. Eldritch Fury. Ranged Weapon Attack: +7 to hit, range 60/200 ft., one creature. Hit: 22 (4d10) force damage. Eldritch Blade. Melee Weapon Attack: +6 to hit, reach 5 ft., one target. Hit: 9 (2d6+2) slashing damage plus 17 (3d10) force damage. Watch for a poll at the end of the week so that you can help decide which of our final entries becomes the next Monarch of the Monsters!